We had our first game of Muskets and Tomahawks this past Sunday. I remember talking to Iannick a couple of years ago about SAGA and him pulling out the rulebook that he just got and I remember him saying that this book was from the same writers. I was not paying a whole lot of attention then as I was focussed on starting to paint my Vikings. As time went by, it seemed harder and harder to arrange a game of SAGA and by then Iannick had enticed us into the French Indian Wars with a couple of games using the ruleset This Very Ground. I liked the era and the rules were quite good, but I am really just enamoured of IGOUGO rulesets and I knew M&T was card driven. At the same time, after looking at Iannick's Conquest Miniatures figures, I decided to paint some myself. I really had no idea about what I needed so I order the rulebook and figured out how to put together a force. I would have liked to do the French, but I knew there was no way to get my Quebecois ami to yield on this one so I was not left much choice but to do the British. So, I decided to assemble around a 300 point force and before you knew it I had good old Major Joseph Gorham painted with some of his famous rangers from Massachusetts as well as a unit of Dank's and Roger's Rangers, some Mohawks, some colonial milita and some civilians. Forty figures, I believe, all pumped out in the last 6 weeks. I will try to take some specific photos soon to show off the figures in another post but you will see some below. I had read through the rulebook a couple of times last week and they did seem quite straight forward. I made some accruements for the game, packed up some figures and drove to Montreal last Saturday. We had decided to have a 300 point match and used the rulebook to generate the terrain and the scenario. All amazingly straight forward. Both sides dice for objectives, Iannick got the Engagement Objective and I got the the Raid Objective. I know this sounds odd but the two objectives really meshed together easily, with the Victory Condition for Iannick to kill 2/3 of the English, while I had to destroy a small French hamlet by burning down the houses. So off we went, both for our first time, with this ruleset. So here is the terrain, with the French village in the far ground, we diced for it's position and then laid out the rest of the terrain. Essentially I started in the bottom right on this 4'x6' field and Iannick started at the top left. One of the neat things about the rules that units designated as Scouts can start the game on hidden movement markers. For every 2 markers that represents a real unit you can place a dummy marker. You can deploy the unit when you want or have to deploy it when it is spotted( comes within 48" of one enemies units or markers in openterrain or 24" in light cover). In this game there is a lot of cover, so you really can get quite far as you can see before you are spotted. Most of our units had the Scout trait, so all my units but one were on hidden movement and I believe all Iannick's were on markers. I sent my dummies off to the right in order to force some of Iannick's units away from the village. An amazingly unsuccessful strategy as it turned out. My biggest unit with 8 figures: Gorham's Rangers. British colonial miltia, who were the heros of the day. Iannick was very clever in putting together his warband: Canadian Miltia, the famous Courreur des Bois with a Native trait (-2 to hit in cover) and nasty Algonquin Indians with the Savage trait ( re-roll all misses in melee, can you believe it). 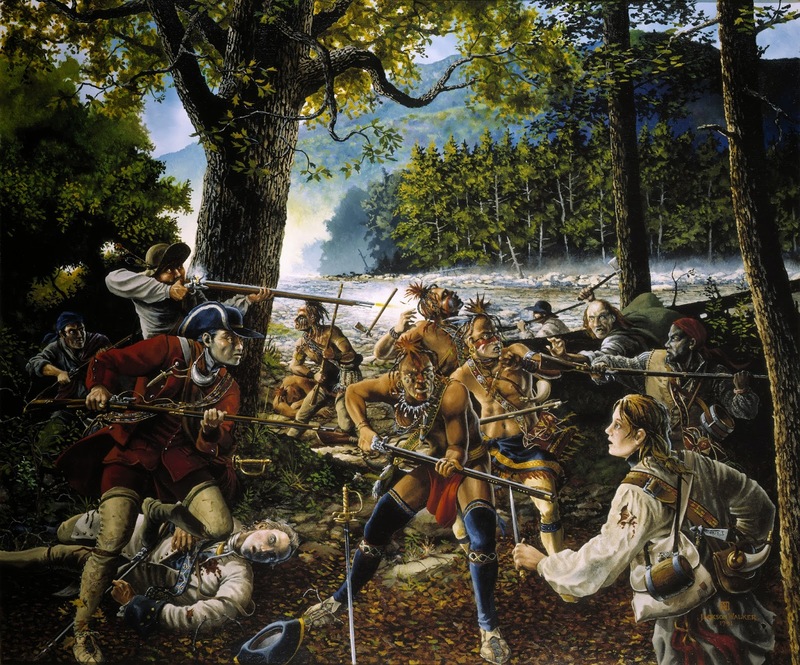 Here we see my Gorham's Rangers hopelessly trying to hit the Canadian militia with muskets while they were in light cover, it was almost impossible! Bang...bang....bang with no success, and every time I advanced to melee they retreated! Very clever. Here we can see the action in the middle of the terrain with my unit of Roger's Rangers advancing to take on another unit of Canadian Miltia. Behind the rocky outcrop is one of my hidden movement markers, with which I am hoping to ambush the Canadians. Little did I know at the time about the Savage trait of those Algonquin. Roger's Rangers, before they were annihilated by the Correur des Bois. The nasty Algonquin as they advance, they take a -1 modifier for shooting in exchange for getting to re-roll misses on melee. I missed a few pictures here, as they did not come out. But in the foreground from right to left you can see Gorham's Rangers who have been driven back into the trees, the Colonial miltia who were just superb ( none of my Ranger's could hit a barn door) and to the right the my Mohawk who were armed with rifles. I really did a poor job of deploying them. In the cloud of smoke in the middle of the terrain behind the rocks is a brutal melee between Dank's Rangers and the Algonquins. The Savage trait is something I will watch out for in future games, you really do not want to melee this fellows. The only time I saw some perturbation on Iannick's face, just after a unit of his beloved Correur des Bois threw a 1 in reaction to a shooting casualty and routed off the table. By now Gorham's Rangers had got their moxie and were pursuing the Canadiens towards the village as can be seen in the far ground. They were dogged and almost made it to the village, but alas by now 5 turns had elapsed and it was all done. Iannick pointing out the error of my ways. Well I believe a marginal victory is due to the French, neither of us had met our victory conditions, but certainly more British had died then French. C'est la vie! We found the game very easy to play and after a couple of turns we really did not have to look things up. The rules are very well constructed with an easily remembered shooting and combat mechanic. I am not the best judge of how realistic the game was in recreating a skirmish encounter in 18th century North America, but Iannick who has a much better knowledge of the history felt the rules were quite good. Certainly a keeper, and I have already put n my order to expand my warband to 400 points and beyond. Looks like a fun outing. The bonus of almost beating Ianninck's Quebecois must have been good! It was a great game, I really enjoyed it, and the rules are very good. We'll have to play again soon. And just think it was not taken on purpose! I just seemed to come across it. Greate looking game and a very nice AAR ! Only one small thing...as I geting older and the eyes dont work as good as they used, I had a hard time to read the smaller picture texts. Greate that you liked the rules, I do that to, especially as they have turned out to work good with 5-6 players. Looking forward to read more about your upcomming games. A great looking table, and beautiful figures...nice report! Very entertaining AAR and lots of very inspiring pics of fabulous figures. Great looking table and nice miniatures - I liked the Indians best. They are [part of what make this conflict special. Good report. The figures and table look nice too. I look forward to reading more.